Maryland will no longer accept cash at Baltimore's Key Bridge toll booths starting this fall, part of a planned expansion of E-ZPass-only toll booths across the state's toll facilities. It is part of a planned expansion of E-ZPass-only toll booths across the state’s toll facilities. Drivers without an E-ZPass will get a bill in the mail that charges more than the posted toll rate, currently 1.5 times the base toll rate. In this round of work, electronic tolling gantries are set to be installed on the Baltimore Beltway (I-695) at the Key Bridge by September, with the new cashless tolling rules starting in late October. The current toll booths will be torn down over the next two years. Drivers are currently being directed to either the Key Bridge or Fort McHenry Tunnel (I-95) for the next two years due to major construction on the Baltimore Harbor Tunnel (Interstate 895) that includes a two-month closure of the northbound tunnel bore starting Friday. The Hatem Bridge, on U.S. 40 in Harford and Cecil counties, is also scheduled to switch to cashless tolling in October, with the toll booths there also demolished by spring 2021. Maryland Transportation Secretary Pete Rahn hopes the cashless tolling reduces traffic backups and reduces state toll collection costs. 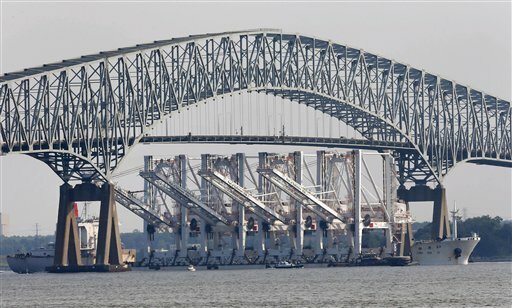 According to the Maryland Transportation Authority, 80 percent of drivers use E-ZPass today at the Key Bridge, 93 percent at the Hatem Bridge.